Probably the most innovative sports racers of the mid-late 1960s were the Chaparrals of Texan Jim Hall. His Chaparral 2C sports cars dominated the 1965 SCCA Road Racing championships and completely outclassed the field. Amongst the innovations that Chaparral cars introduced were full fiberglass monocoque chassis, automatic transmissions, moveable airfoils to improve downforce and handling, tall wings on cars, and the first practical application of ground effects . His 2C and 2D cars of the mid 60's had a rear wing that was activated by a pedal in the drivers compartment. For the straights it was full horizontal and when entering turns it was transferred to a more vertical position, helping to slow down the car. Without the automatic transmission, this would not have been possible. 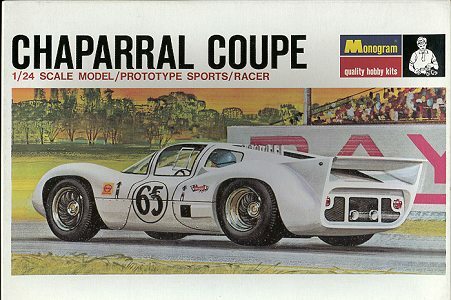 Due to whining from other competitors about Hall's Chaparral racers, rules were adjusted to eliminate most of his innovations. Because of this, Hall left sports car racing and entered into the Indy car ranks as an owner and designer where he was quite successful. Eventually it ceased to be fun and he quite racing entirely. Monogram's kit of the Chaparral 2D is really just a slot car body. I can remember back in the late 1960's when the craze was at it's height, this and other Monogram cars were quite accurate, but not that fast. Nonetheless, they did sell well to those seeking a home slot car track. 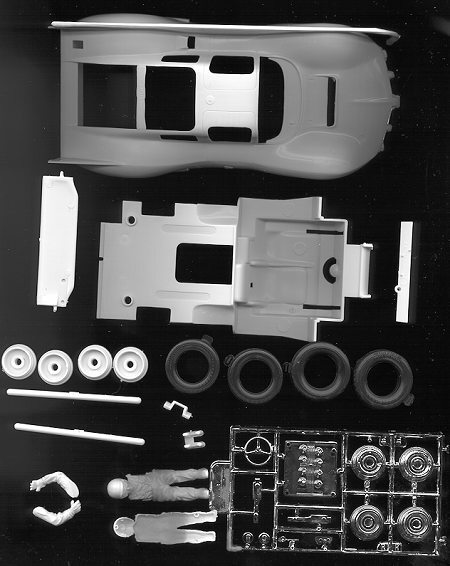 The result is a kit that despite its 40 parts (8 clear, 4 rubber, 12 chrome and 16 in white plastic), actually needs some work to be made into more than just an interesting curbside. There is no engine, no suspension, and an interior that is quite devoid of detail. One does get a driver figure that can be used to help fill the interior. Also included is a decal sheet for the #65 car that ran at the Daytona 24 hours race in 1965 (or was it 1966). One thing you won't see on the sheet is an army of advertisements. Even in NASCAR at the time, the advertising was minimal. Anyway, Daytona was the only race that this car ran in this configuration. For the next race at Sebring, the body shell was modified quite a bit and so the car for any other race cannot be built using this kit without greatly altering this kit. Since the kit was designed as a slot car body and one that had a rod and counterweight to allow the wing to move, you'll have to do some filling to the aft structure to close the hole in the body as well as fill in an attachment point on the underside of the rear wing. Despite the age of the kit (and this is the first time it has been rereleased since the late 1960s), it is relatively flash free and the molding is still crisp. There are a few sink marks in the back of the body and some mold release marks on the wing that will need filled as well. Overall, it looks like it can be built into a very nice kit with a bit of extra work and patience. I have built the similar Ferrari 275P kit and it turned out quite nicely. Review copy courtesy of me and my wallet!! If any of you manufacturers or shop owners want to send products for review, please contact me.